General Appearance Smart, workmanlike, well balanced and compact. Characteristics Affectionate, obedient and easily controlled. Temperament Happy and volatile, rarely of shy nature. Game and fearless but definitely not aggressive although at all times able to hold his own when necessary. Head and Skull Flat, of moderate width between ears. Jaws powerful, clean cut, rather deep and punishing. Stop not too defined, medium length from stop to end of nose. Eyes Relatively small, dark, expression indicative of temperament. A round, full eye undesirable. Ears V-shaped, small, leathers not too thin, set on fairly high, carried forward and close to cheek. Mouth Jaws strong with perfect, regular scissor bite, i.e. upper teeth closely overlapping lower teeth and set square to the jaws. Neck Moderate length and thickness, slightly arched and sloping gracefully into shoulders. Forequarters Shoulders long, sloping and well set back. Legs straight and muscular, possessing ample bone, with upright and powerful pasterns. Body Back short and well ribbed up, loin strong, good depth and moderate width of chest. 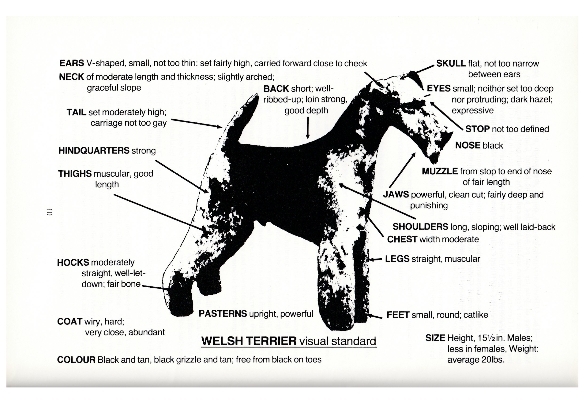 Hindquarters Strong, thighs muscular, of good length, with hocks well bent, well let down and with ample bone. Feet Small, round and cat-like. Docked: Well set on. Carried erect but not too gaily. Undocked: Well set on. Carried erect but not too gaily. In overall balance with the rest of dog. Gait/Movement Fore- and hindlegs carried straight forward and parallel. Elbows move perpendicular to body, working free of sides, stifles turning neither in nor out. Coat Wiry, hard, very close and abundant. Single coat undesirable. Colour Black and tan for preference, or black grizzle and tan, free from black pencilling on toes. Black below hocks most undesirable. Size Height at shoulder not exceeding 39 cms (151/2 ins). Weight: 9-9.5 kgs (20-21 lbs). Faults Any departure from the foregoing points should be considered a fault and the seriousness with which the fault should be regarded should be in exact proportion to its degree and its effect upon the health and welfare of the dog and on the dog’s ability to perform its traditional work. Note Male animals should have two apparently normal testicles fully descended into the scrotum.